This spring has been a good one for my Auriculas. I have been please with a powder blue flower that I hope to propagate by division in July. First I will water well and add some dilute feed. 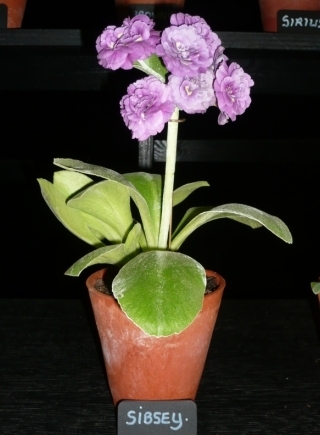 These Alpine Auriculas look excellent when grown in 3 inch pots. The ‘Long Tom’ pots are silghtly taller than the traditional pot and are useful as Auricula tend to grow a ‘carrot root’ used to anchor the plant in the wild. Alpine Auriculas have either a golden yellow or cream centre surrounding the tube. Show Auriculas are considered to be the star Auricula plants and must have a ring of dense Farina around the eye of the flower. 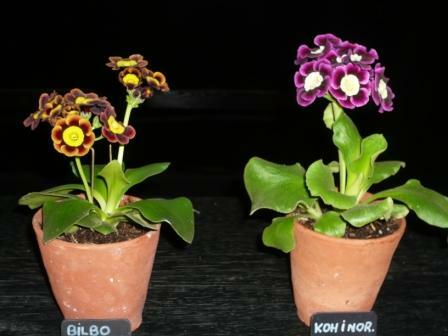 Selfs (all one colour) and Edges including most stripes have an outside edge composed of leaf tissue such as the ‘Orlando’ a grey edged show Auricula. Green edges usually have larger flowers. Stripes have recently been reintroduced with Monmouth Star having red petals with yellow rays out to the flowers edge. The Gladiolus family are fine addition to the colourful garden. They also make fascinating subjects for the gardeners who like a challenge of the show bench. 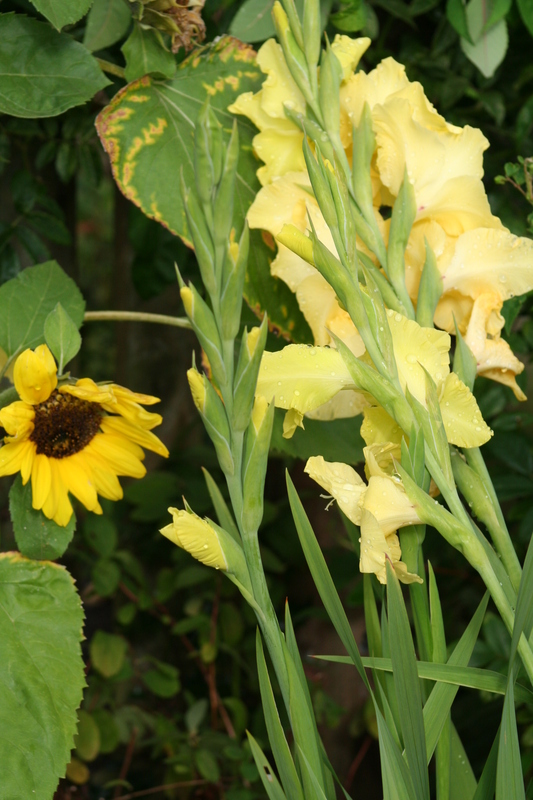 Raised beds are good for soil fertility and can help you get some stonking great Gladioli. Mulch the bed heavily to reduce the amount of watering you need to do and feed with blood fish and bone. Plant 6″ deep and at least 4″ apart (more for show varieties). Do not plant dormant corms but wait until small root swellings appear around the base. Dust or dip in fungicide before planting. Plant when the soil has warmed up on a layer of sand or vermiculite to aid drainage. To keep the stems straight tie to a cane below the first bud and add loose ties as it grows. A tee-pee of horticultural fleece can help prevent late frost damage or the bleaching effect of too much sun on red gladioli. During the heat of the day tease flowers forward to get them to open to the front – in the cold they will break off. Leave at least 4 leaves on the plant when cutting to ensure the new corm swells. Lift 5-6 weeks after flowering, dry off, label and store for next year. Well illustrated with lots of photos and a huge amount of information ‘The book features best planning, design and decoration ideas from the last five years of shows, including masterclasses with gold-medal winners, celebrity designers, RHS experts and the world’s top plantsmen and plantswomen. 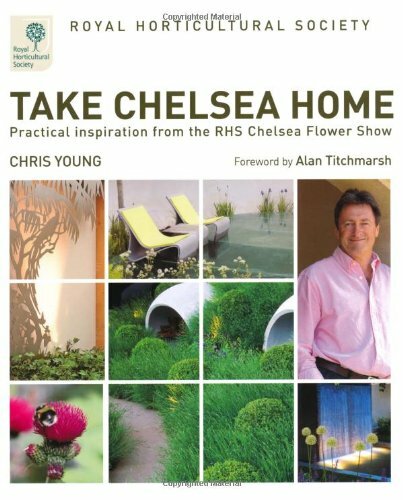 The design and planting ideas inside the book are not just enviable but are made achievable for show-goers and armchair gardeners alike.’ It is so good you wont need to read Gardeners Tips much longer. Take in a show after the show with an organised break.